The Club regrets to inform Members that Tim Parnell passed away earlier today. He was 84 and had been in poor health for some time. 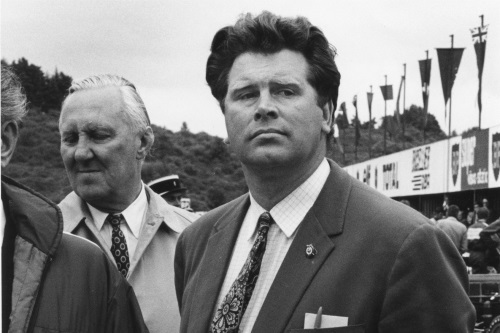 Tim’s father Reg was one of the leading British racing drivers in the years immediately after World War 2 before becoming the Aston Martin Team Manager. During the war Reg had acquired a significant number of good racing cars, using his transport business to recover them to his farm until the cessation of hostilities. Tim therefore grew up as a farmer with a passion for motor racing, accompanying Reg to races around the UK and Europe. However, it was not until he was well into his 20s that Tim started racing, first with a Frazer-Nash Le Mans Replica and then with a Manx-tail Cooper-Climax T39 in which he enjoyed some success, particularly at his home circuit of Mallory Park. For the next two years Tim raced a Formula 2 Cooper-Climax T45, becoming a stalwart of the F2 circus which travelled around the UK and Europe. In the major races a good result for Tim would be at the lower end of the top 10 but nationally he won races at Mallory Park, in June 1959 in particular against a very strong field. He also won at Silverstone and finished third, again against strong opposition, at the one off F2 race at Whitchurch airfield, near Bristol. For 1960 Tim acquired a couple of Lotus Type 18s, one for F2 and the other for Formula Junior to supplement the F2 Cooper which was beginning to feel its age although fourth place at Chimay behind the likes of Jackie Lewis, Ron Flockhart and Lucien Bianchi was a notable achievement. The F2 Lotus (#904) was initially raced by World Motorcycle Champion Geoff Duke and once, at Modena, by Stirling Moss but without a result. With the FJ 18, Tim again enjoyed success at Mallory Park, finishing third behind the Team Lotus cars of Peter Arundell and Mike McKee. Tim retained the F2 18 for 1961 when in effect F2 became F1. As one of the Three Musketeers (the others being car Gerry Ashmore and Andre Pilette) Tim enjoyed varied results. Third place in the Lewis-Evans Trophy, a national F1 race at Brands Hatch at the end of the year was the best with a couple of fifths at Karlskoga and Roskilde. In his two World Championship races, Tim was 10th at Monza and retired at Aintree. At the start of 1962 Tim knocked himself about a bit in a crash at Brands Hatch and raced only occasionally. However, his team built up a couple of Type 18/21s, one of which was run for another World Champion motor cyclist, Gary Hocking, who was showing considerable ability in cars when he crashed fatally in the Rob Walker Lotus Type 24 in South Africa. Tim acquired a Lotus-BRM Type 24 for 1963 which was usually raced for him by Masten Gregory without much luck. Tim’s last race came in this car in the non-championship Austrian Grand Prix on the rough old Zeltweg airfield when he finished an unclassified sixth. In January 1964 Reg unexpectedly died at the age of just 53 and Tim took over the running of Reg Parnell Racing using Lotus-BRM Type 25s for Chris Amon, Richard Attwood, Innes Ireland and Mike Hailwood with a best result of fifth in the 1964 Dutch Grand Prix for Chris. The first year of the 3-litre Formula 1 in 1966 saw Tim running a 2-litre Lotus-BRM Type 25 principally for Mike Spence. Over the winter months of 1965/66 and again the following winter Tim was asked by BRM to manage its Tasman campaign with Graham Hill, Jackie Stewart, Richard Attwood, Piers Courage and Chris Irwin as drivers. This led to Parnell Racing becoming a F1 BRM junior team, running P126s for Piers and Chris. With Tony Rudd moving on to Team Lotus, Tim became the main BRM team manager with Pedro Rodriguez, Jo Siffert, Peter Gethin, Jackie Oliver, Howden Ganley, Jean-Pierre Beltoise and Niki Lauda among the drivers. The Tony Southgate-designed cars won several Grands Prix but by the end of 1974 Tim had had enough of life under the BRM regime of Louis Stanley and his wife, Jean. He could not stay away from motor racing for long and, for a time, was Manager of Oulton Park and Mallory Park for Motor Circuit Developments which was followed by a stint as General Manager of Donington Park. In 1995, in the aftermath of the Walkinshaw ructions, Tim became a very active director of the BRDC which continued until 2003 when he became a Vice-President until 2010. Tim was elected as a Full Member of the BRDC in 1962, subsequently becoming a Life Member. He was extremely proud of his father’s achievements and cared deeply about the Club even if he did not always see eye to eye with others. Tim was Regional Co-ordinator for the East Midlands for many years. He also took a genuine interest in the careers of young drivers, no doubt dating back to his days running the BRM junior team, and was always available to speak with them and to present trophies. A staunch supporter of Derby County through thick and thin, he was a great character who will be much missed from the Clubhouse. To his wife Liz and to his family and many friends, the BRDC extends its sincere condolences. The funeral take place on Monday 24 April at St. Helen's Church, Ashby de la Zouch, Leicestershire LE65 1AA at 12.30pm. There is limited parking available at the church so any attendees of the funeral are advised to use the paid car park at the Royal Hotel, Station Road, Ashby de la Zouch LE65 2GP which is a five minute walk from the church. A wake will be held afterwards at Nook Farm, Packington Nook Lane, Ashby de la Zouch LE65 2QG. All BRDC Members are welcome to attend.